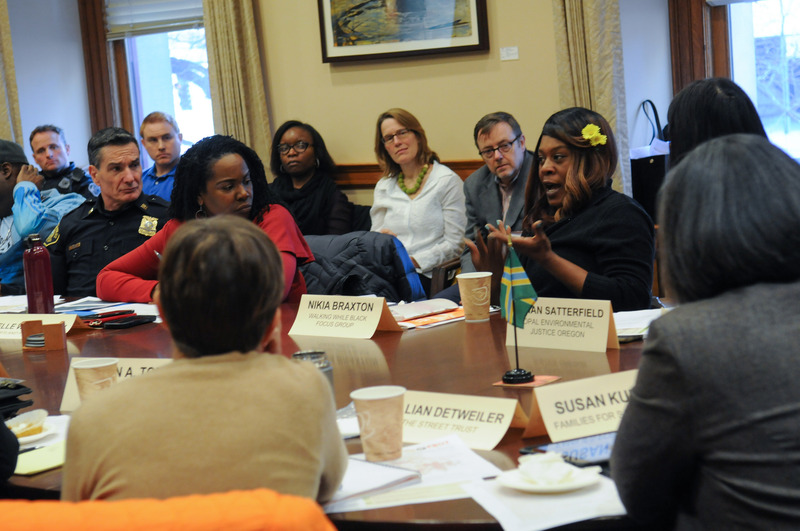 Vision Zero Task Force member Karis Stoudamire-Phillips speaks at a meeting in City Hall yesterday. We hear from many of you that it feels like streets in Portland are getting more lawless by the day. One reason is a severe lack of police presence due to a staffing shortage that’s been years in the making. The flip side of that is a concern among traffic safety advocates and the Police Bureau that too much presence in certain parts of the city might lead to unfair or over-policing. The latest alarm bells over this challenging dynamic came yesterday in City Hall at a meeting of the transportation bureau’s Vision Zero Task Force. Traffic Division Captain Michael Crebs laid out the current state of traffic enforcement as part of a broader discussion about racial bias from police and road users in general. And newly appointed members of the Task Force laid down some truths about what it’s like to experience racial bias in the right-of-way. In 2012, officers from the Traffic Division pulled over 35,133 people. By 2016 (the last year complete data is available) that number had fallen to 19,798. Capt. Crebs said preliminary numbers show that his officers made only about 10,000 stops in 2017. — Michael Crebs, Traffic Division Captain. Keep in mind that Traffic Division officers do the lion’s share of stops for all the things we usually focus on around here like speeding, dangerous turns, and other moving violations. Precint-based patrol officers focus on service calls and crime prevention and reduction. The PPB has about 400 total officers and only 21 of them are Traffic Division officers. Making matters worse, due to staffing shortages, Crebs said he’s been forced to rotate his officers out of Traffic to cover patrol duties. “25 percent of my officers’ time is spent at a precinct,” he said yesterday. 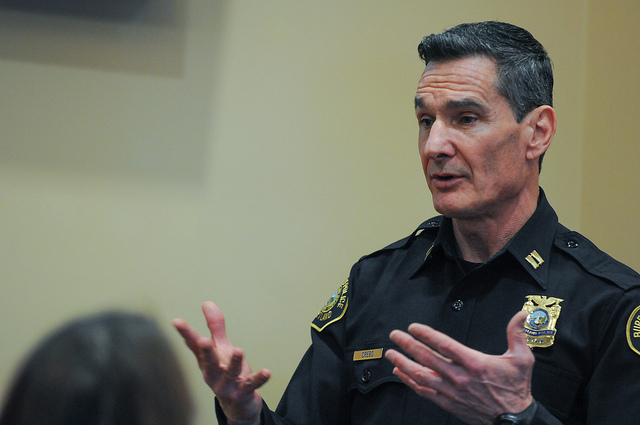 “So in a sense, I have about 16 officers out-and-about at any given time out there enforcing traffic laws.” In 2012 Crebs oversaw 29 officers — nearly double the amount he has now. And the number of officers looking for bad drivers is actually much lower than 16 because they’re spread out into shifts. “On any given day you only have five or maybe six officers actually working traffic patrol,” said Crebs. That’s five or six officers patrolling tens of thousands of drivers on 4,842 miles of streets in our city — a city that added nearly 60,000 new residents between 2010 and 2016. Thankfully, due to a local economy that Mayor Ted Wheeler described yesterday as, “More robust then it’s ever been,” the PPB might finally get the funding it needs to staff up. Their latest budget requests $12.3 million to hire 93 new officers — 21 of which The Oregonian reports will help create “walking beats” and other roles to get officers out of their cars and into the community. Being short on staff isn’t the only enforcement problem Crebs faces. He’s also trying to balance the need for enforcement with concerns around racial bias. In the adopted Vision Zero Plan adopted by City Council in 2015 increased enforcement was not a recommended priority because a majority of Task Force members thought it would lead to racial profiling. 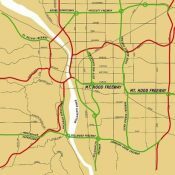 The conundrum is that the vast majority of dangerous traffic hot-spots are in places PBOT calls “communities of concern” — defined by Census tracts with a higher amount of people of color, low-incomes, poor vehicle access, limited english proficiency, people with disabilities, and older adults and youth. To the City of Portland’s credit, they have not shied away from the issue of racism in the right-of-way. Task Force members received a presentation yesterday from the PPB’s Diversity and Equity Manager Elle Weatheroy who outlined the new racial bias trainings all officers must go through. They also heard from PBOT Equity Committee member Irene Schwoffermann who reminded the Task Force that hate crimes are on the rise in Oregon and that Portland is no stranger to racially-motivated street attacks. Task Force member Vivian Satterfield with OPAL Environmental Justice Oregon said their office on SE 82nd Ave has had its windows broken three times — including once during a recent white supremacist march. “Solving all these other issues is not a fair onus to put on our infrastructure,” she said, acknowledging that Vision Zero must go beyond street designs. 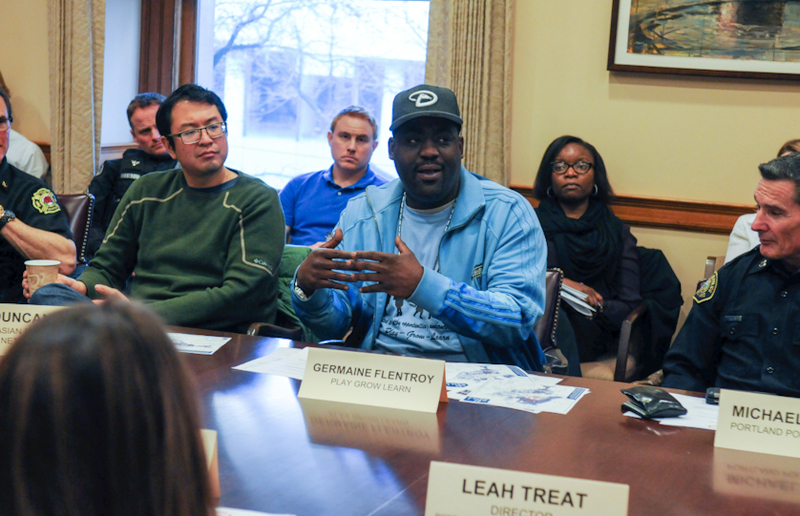 Task Force member Germaine Flentroy. 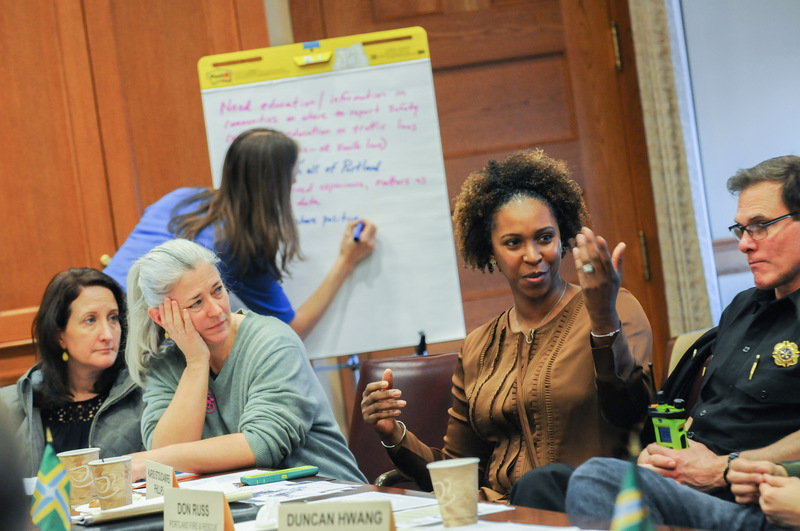 Nikia Braxton shares her thoughts while PBOT Active Transportation and Safety Division Manager Catherine Ciarlo, The Street Trust Executive Director Jillian Detweiler, PBOT Deputy Director Chris Warner, and others look on. The Task Force has also added a member — Nikia Braxton — who lives carfree and came from PBOT’s Walking While Black Focus Group. That group was inspired by the eponymously named research by Kimberly Kahn at Portland State University. Braxton, along with Task Force Members Germaine Flentroy and Karis Stoudamire-Phillips, did not hold back when describing their experiences. Braxton grew up in the Albina and Alberta neighborhoods and spoke about how many of her friends and family now live out “in the numbers”. And there’s another thing: “There’s a lot of people that don’t like the fact that these blacks came out to 162nd,” Flentroy added. Hearing and feeling the real stories behind the data is essential if Portland wants to make any significant progress on Vision Zero. Speed and red light cameras are color-blind. Hi Buzz. In her opening remarks at that meeting PBOT Director Leah Treat said almost the exact same thing: “Cameras can’t racially profile.” So you’ll be happy to know they are on a similar wavelength. True, automated enforcement is a great first step to bias-free enforcement out on the streets. It’s a pity our speed camera enforcement requires that motorists be traveling at nearly-reckless speeds before they can be used to cite these menaces. Why are we so afraid of using proven technology? Likely because our lawmakers realize that our motorists really do think they have a right to drive at almost any speed they want to. … but the courts are not. White folks are much more likely to appear in court on time and to have legal council and get charges reduced or even dismissed, than any other racial group. Do you think that is an economic issue or a cultural one? When it comes to medicine, individuals (men, especially) from specific demographic groups are less likely to seek care because it is a cultural issue – not wanting to appear weak. How do we help people show up to court? That sounds like a personal problem. It’s not exactly a personal problem if white people are more likely to have jobs that give them more flexibility to leave work during the day to go to court, and people of color are more likely to have lower paying jobs that they can’t afford not to go to (or might get fired if they miss). There are all sorts of societal structures that makes just about everything easier for white folks and harder for people of color. Calling it a “personal problem” ignores extensive systems that have crafted this system for the benefit of white people. You are describing a structural problem facing all people with inflexible work schedules. It might well do so. Our legal system can inflict considerable collateral damage on the people who interact with it, and the poor, as always, are disproportionately impacted. considering that automated enforcement often specifically target areas where people of color and other marginalized communities tend they live, they are often the epitome of institutionalized racism and bigotry. and i say this as someone who supports automated enforcement as long as there is mitigation and any revenue is directed at improving the lives of those who are less-well served by our predatory economic system. Are you saying that enforcing laws protective of the most marginalized in the communities in which they live is an example of bias? Would it be less biased to focus those resources on wealthier neighborhoods? I’d love automated enforcement in my neighborhood. The people living in those communities are affected by dangerous driving as much as the people driving in them would be affected by stronger enforcement. No — that’s exactly the issue. No one here has disagree with that issue so presenting it as a topic for debate is a strawman. You are applying logic to something that another person is applying a sense of “justice” to. Completely different languages. Personally, I choose logic, because “justice” varies by person. Almost every conversation I have with you involves a strawman. What is the source of this bad faith? 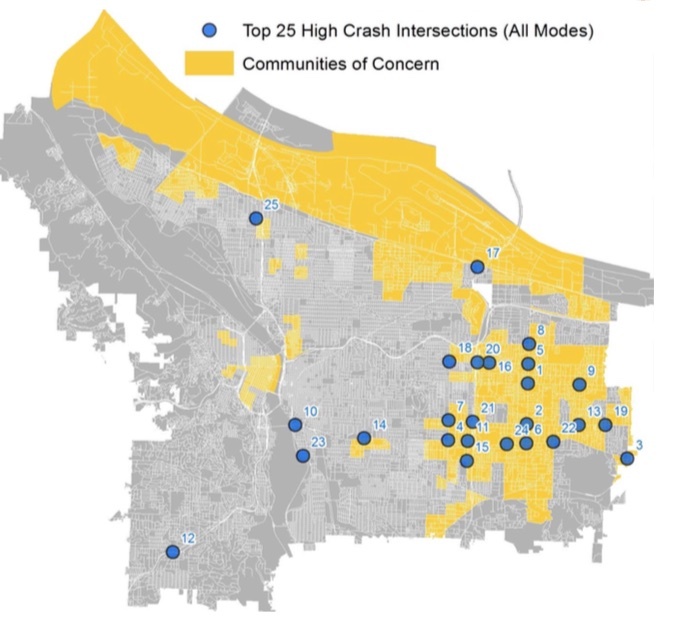 The most dangerous arterial roads in Portland overlap substantially with areas where marginalized communities tend to live. Given this institutionalized racism/bias, automated enforcement ends up being a biased tax on these communities. I support automated enforcement that is designed to mitigate this injustice by providing programs that waive fines for vulnerable populations and/or using any revenue to reverse institutionalized bias (e.g. by funding transportation alternative). In this manner, we can protect vulnerable communities from traffic violence without causing further economic hardship. Waiving fines undermines the point of enforcement, and doing so on a racial basis is almost certainly illegal (and irrational). How fines are used is an unrelated issue — enforcement is not (or should not be) an exercise in revenue generation. You don’t ever want to tell a community they can get the improvements they need, but only after 833 more people get a traffic ticket. I believe all communities deserve protection from people driving dangerously. Sometimes these conversations do degenerate. I mean, really. It is as if this were a completely novel problem, one not recognized, much less tackled successfully anywhere on earth. Enforcement without bias is not an insurmountable task. Clever people + accountability + oversight + a plan, and we’re on our way. Let’s make it happen; refuse to settle for anything less. So do I. That’s why your tacit assumption that I oppose pervasive automated enforcement is a strawman. In fact, I would love to see progressive fines that could result in hundred thousand dollar fines for some Portlanders. Yet this is where many of the areas in greatest need are. I am more concerned with the VRUs than with the drivers who endanger them. Where you say “targetting” I say “benefitting”. Personally, I would welcome greater automated enforcement “targeting” my neighborhood, though the need is less than in other areas. I think a $100K fine for speeding would never withstand legal muster, so if that’s the solution to the institutional racism of automated enforcement, we’ll probably be awaiting a solution for some time. This says absolutely nothing about whether I believe that automated enforcement is readly achievable in a way that respects the racist geography of traffic violence in this city. Above, I discussed a mix of tools that could be used make automated enforcement more equitable and never once suggested that any one of these things was a deal breaker for me. In fact, most of the mitigation tools I brought up are actually discussed in Portland’s Vision Zero report. IMO, the biggest barrier to automated speed enforcment is that it is illegal on most roads. In europe the substantial revenue from automated speed enforcement is often used for safety infrastructure and alternative transportation. As I very clearly stated above, this is one of the thing that could be used to offset the negative impact on vulnerable communities. I think the impact on communities would be almost entirely positive. And be sure to pay particular attention to what folks have observed about the *negative* impacts of policing on communities of color, including policing-via-traffic-division. Thinking specifically of automated enforcement, the benefits are fewer VRUs injured and killed, a safer and more welcoming environment for non-automotive transport, etc. You know this well. and i support automated enforcement but this conversation started because someone claimed, wrongly, that it is color blind. it is not and this should be address. if you believe that charging fees/taxes to reduce a negative externality is wrong, then i guess you also oppose taxes on cigarettes, gasoline, and booze. Where in the world did you get that from what I posted??? traffic violence is not a negative externality? It is, of course — I think I’ve made it clear that I support increased enforcement (and other measures that aren’t on topic here) to reduce the threat posed by unsafe driving. Though I wish there were more enforcement in my neighborhood, given finite resources, I would choose to focus efforts on areas where the threat is greatest, and thus the most good could be done. And if they put the speed cameras just in wealthier neighborhoods, they’d be accused of bias because they are “only making rich neighborhoods safer”. Once again, no one here has proposed banning automated speed enforcement in any neighborhood. I’d like to see them on every road where speed is an issue and I’d like wealthier people to be the major revenue source from this needed tool. How would this work out in terms of leveled fines for different rates of speed (and is age a variable), and would it have the intended consequence of reducing speed for everyone? For example, would someone who earns $1000,000/year pay $400 for going 40 mph in a 30 mph zone while a high school student who earns $8,000/year pays $100 for going 50 mph in a 25 mph zone? Tickets should also factor in vehicle weight. I don’t want anyone to see law enforcement as a revenue stream, but, more importantly, I would like miscreants of all stripes to be the major “beneficiaries” of greater enforcement. If your model of “equity” demands focusing traffic safety efforts in areas where the wealthier live and work, that would indeed be a perverse outcome, as the traffic safety benefits would largely accrue to those communities. People see it that way now, and they always will, regardless of the truth. Many people see the 20mph speed limits as a money grab, despite the fact that there is almost nobody available to enforce it. I’m not ready to give up the hope that people can live down ignorance, misconceptions, as you yourself noted in a passage I quoted in another thread the other day. I’m waiting to hear our leaders speak the truth. I’m optimistic that maybe one day they will. And again with the strawmen. I vehemently disagree with the above and have never suggested anything remotely like this. It’s hardly a strawman to suppose a more equitable outcome (in your view) would be to “target” areas where less marginalized people live. You may not agree with that, but it is hardly a strawman, and it is not a crazy extrapolation of your rather strong assertion. Soren, is there anything that doesn’t represent institutionalized racism to you? Do we have any institutions that don’t have a looooong history of racism hereabouts? If you are expecting to find something, you will. Is that 400 officers total in the Police Bureau? Or 400 at any one time, during any particular shift? Officially the PPB has over 900 officers, so are we to assume the latter? If it’s the former, then Portland is in deep s**t.
Yup. It’s a good idea to have to some self reliance and the ability to protect yourself. The police are just not going to be there for you. Agreed. I was jumped from behind on the street four or five years ago by a mentally unbalanced teen who fortunately weighed about 30 pounds less than me. I eventually got the upper hand and multiple people called the police (this was in the middle of the day and right downtown, around 3rd and Washington or so). Ten minutes later, no police, calls to dispatch got the response “they’re not fighting anymore?”. So…I told the kid to buzz off and not do that again. Never mind that he actually needed some kind of social services and had been kicked out of his home (according to him). That’s what our property taxes gets us…the City that Works? According to the 2017-18 city budget (pp 183-4), there are 1,227 people working for the Portland Police Bureau. Of those, 647 are “police officers”, 134 are “police sergeants”, 31 are “police lieutenants”, 90 are “police detectives”, 13 police captains, 1 police chief, 3 assistant chiefs, and 5 police commanders, for a total of 924 people that the community would typically call “police officers”. Again, I’d like to know where the 400 figure came from. Every year we go without real traffic law enforcement will make it harder to ever implement it. Without enforcement, I’m not optimistic PDX will ever get to even 10% cycling modal share in the absence of large external factors (oil market disruption, autonomous vehicles, successful children’t climate change lawsuit or some other thing that comes from outside). In spite of appearances, people aren’t actually stupid. They can see the chaos that has been created on our roads and want no part of being a vulnerable road user on them. Of course they’re not smart either since they don’t change their odds by much when they get into the can. I’ve found driving on the highways around Portland to be considerably more scary than it was 5 years ago. The dream of the 90s is no longer alive in Portland. I wasn’t talking about travel times. I’m talking about packs of dudes in their Ram trucks tailgating me and swerving around from lane to lane without signaling. It’d be nice to be able to find a spot on the highway where you won’t get bullied every few minutes or so. Thanks for this article, Jonathan. I wonder if policeman as a career in the US has suffered any hits in recent years? since it is—by their own admission—drivers who are no longer being policed by the atrophied traffic division, why don’t we pay for this public service through taxes on automobiles/registration/fuel like they do in other countries? Double dividend if you ask me. Crebs seems to be wringing his hands, mostly. I look forward to hearing from the new Police Chief Danielle Outlaw on this subject. She acknowledged some pretty mighty things at her swearing in ceremony. Is there any evidence that the Traffic Division enforces traffic laws in a racially biased manner? If there isn’t, can we get enforcement added back to our Vision Zero efforts? This is a topic where I think we need to really listen to the experts who actually have experience a and training in this field. The obsession of police enforcement is mostly rooted in the perception and an uninformed understanding of how the built environment influences people’s behavior. The most dangerous streets in our city was built to encourage dangerous driving behaviors (e.g. speeding, DUI, etc). Leah Shahum, founder of Vision Zero Network, wrote this piece to stress that cities should not over-emphasize on traditional traffic enforcement because of racial bias and equity concerns. Automated speed cameras have shown to be more effective in reducing fatalities. Everyone thinks they know something about traffic safety or transportation planning, but that’s just wrong. Our own biases and misconception get in the way of accomplishing the common social goals that most of us value. I think you misread the article and misinterpreted my comment. I think Shahum is referring to the area of social justice and equity when she says she is “far from being an expert in this area”. Also, I never asked anyone to stop discussing this topic. What I am advocating is that we gather facts and look for statistics and evidence about Vision Zero and not let our own misconception and biases steer the discussion in unproductive directions. A discussion is a dialogue where details and ideas about a specific topicare exchanged amongst different parties. That requires the ability to distinguish facts, evidence, and our own preferences/perceptions. Without it, we are just in a shouting match. And unfortunately, a lot of “discussions” about transportation issues in this city are shouting matches not based on facts or evidence. 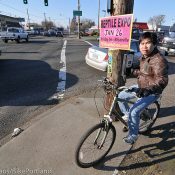 Nobody is over-emphasizing enforcement in Portland. It’s practically non-existent. Yes, we absolutely know that there is racial basis in traffic policing in Portland. Thanks, joan, for joining the effort. I don’t think we’re getting through though. Hello Kitty keeps saying ‘statistics’ don’t show this, but so far Ms/Mr Kitty hasn’t produced any statistics that bear out her/his point. I don’t claim to have all the statistics, only the ones that have been frequently cited in the Oregonian, and the ones posted above. 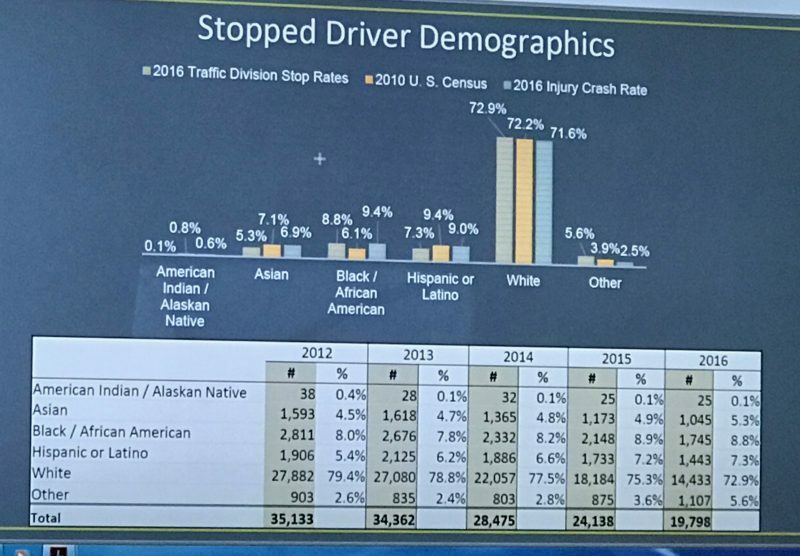 The slide above shows that 8.8% of traffic stops are of black people (not clear if this is traffic division or the police force overall — this makes a difference), yet only make up 6.1% of the population. It also shows that blacks are involved in 9.4% of the injury crashes. Do those numbers show bias? Maybe — blacks are stopped at a higher rate than their proportion of the population. Maybe not — they are involved in a disproportionate number of crashes, so that may merit the higher stop rate. If those statistics involve pretext stops, which I believe are more likely to involve racial profiling, then the case for bias amongst true traffic stops is reduced. I do not claim that these statistics are the final word on the issue or make a definitive case. However, I do claim that it is not obvious from these statistics that the traffic division has a racial profiling problem. They might, but they might not. I’m open to seeing additional data or hearing additional explanations. What exactly would it take for you to accept that there’s racial profiling going on? If a white driver and a black driver run a stop sign, Portland police are more likely to pull over the black driver and more likely to ask to search her car, yet less likely to find anything inappropriate in the car. 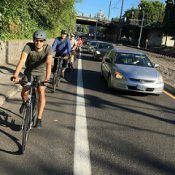 How is this making life safer for Portlanders? How is this not racial profiling? Why are white drivers who violate traffic laws getting a pass from Portland police while black drivers are more likely to be targeted? The police are acknowledging this is racial bias, but you’re still asking for proof of racial bias. You can’t even believe the folks who are acknowledging their biases through their own data collection? First off, I’m not claiming there is no bias, and I’ll note that you are mixing different issues. Car searches are generally connected to pretext stops, where the officer first spots a target they find “suspicious”, then finds a reason to pull them over. I am convinced that in these cases, there is a high potential for racial profiling (and that the evidence that this occurs is compelling). The scenario you described might be different: If the officer is looking for traffic violations, and spots someone running a stop sign, and pulls the driver over for no purpose other than to administer a warning or ticket for the traffic violation, they would have no reason to ask to search the car. If they are asking to search the car, it might be a pretext stop. Evidence that traffic enforcement is biased would strip out pretext stops (perhaps by focusing only on officers assigned to traffic patrols, or in cases where officers asked to search vehicles without good reason), combine statistics about relative rates of driving infractions among different groups (the chart posted above strongly suggests there are differences; this may be known, or could be inferred from crash rates), compared with the proportions of people pulled over in different groups (this is known), whether people were ticketed or warned (known), and information about where traffic patrols occurred (also known). 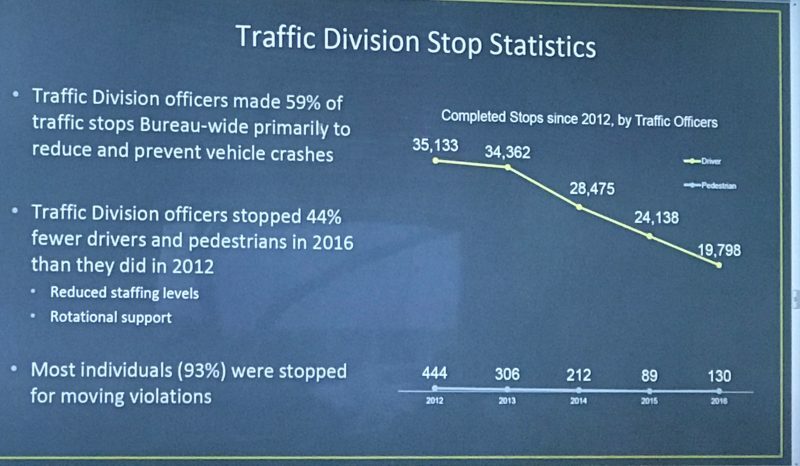 If, for example, the PPD focuses traffic enforcement in high crash corridors, I would expect them to pull over more people from the communities that traveled those corridors more frequently, even in the absence of bias. In short, most or all of the data to build a solid statistical case should exist. Officers who do demonstrate bias should be removed from patrol. TL;DR: the evidence I would find convincing would need to be more than the overall population is 6.1% black and blacks got 8.8% of the tickets, ergo policing is biased. And, to be clear, I am not claiming that the absence of evidence that I am aware of demonstrates the police are not biased (even in the narrow context of traffic enforcement); only that the assertion that they are has not been substantiated in a way that satisfies me. As to Joan’s comment about contraband, that is irrelevant to traffic enforcement. If I run a red light, that merits a stop, whether or not there is a body in my trunk. Whole lot of talking going on. Not exactly true. This is based off “high crash intersections” which is one way to measure danger. Because nobody is out there measuring intersections ir corridors with high amounts of reckless behavior or near misses (ie, without a crash paper trail), we dont know what the other danger spots are. With a total of 5 or 6 PPB patrolling the entire city at any given time, it’s ALL dangerous. Progressive Portland hates the police. But you want more enforcement? Not sure what you expect the outcome to be. Really? As an extremely progressive former Portlander, I was on a first-name basis with my neighborhood officer when I lived there. Why – were you turning people in? So–via unwillingness to enforce the law due to fears of bias we are allowing pedestrians, cyclists, and law-abiding drivers of all pigmentations “equal opportunity” to be killed and maimed by misbehaving drivers? Am I clear about this? Soren, you seem to have a profound unwillingness to listen to anything that contradicts your narrative…and then go so far as to be dismissive of other people’s viewpoint. Try listening instead of acting like a dictator. Calling a strawman a strawman is being a dictator? Once again, no one here has suggested that we should not use automated enforcement due to easily solvable issues with equity. or traffic enforcement, in general. I support automated enforcement that is designed to mitigate this injustice by providing programs that waive fines for vulnerable populations and/or using any revenue to reverse institutionalized bias (e.g. by funding transportation alternative). In this manner, we can protect vulnerable communities from traffic violence without causing further economic hardship. And I will note that you assumed waived fines would be without consequence even though we currently waive fines via diversion programs. We also waive fines for traffic school (maybe that is diversion, I don’t know), and I’ve heard no proposals to end that practice; therefore the fine waiving is currently happening, will continue to happen, and your equity issues associated with miscreants caught by automated enforcement have long been addressed. I’ll also note that anyone is free to avoid onerous traffic fines by driving safely within the law. It’s a choice I make, and many others here make (probably including you), and it isn’t really much of a burden. In fact, I would argue if it’s too difficult to drive legally, you shouldn’t pay a fine — you simply shouldn’t drive. I would support waiving fines in exchange for surrendering your drivers license. this is obviously false. everyone who drives violate the law to some degree. and this is precisely, why concentration of automated enforcement facilities in areas where people of color and/or other marginalized groups tend to live should be addressed. and just because i believe this does not mean that i do not support pervasive automated traffic enforcement in our society. 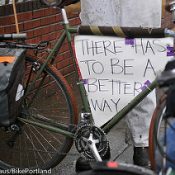 do i need to point out the many, many times i have called for this on bike portland in previous threads? i’m not sure why acknowledging the inherent *geographical* bias in automated enforcement is such a contentious thing. do we want a more just society or not? Not everyone drives more than 10mph over the speed limit or runs red lights. That is a choice, and that’s what current proposals for automated enforcement are focused on. Marginalized groups don’t have a greater need to drive faster or ignore red lights than other groups. I don’t deny the geographic overlaps between high crash locations and marginalized populations; I just deny that currently proposed automated enforcement is more burden than benefit on a given population. You focus on the difficulties people who run red lights or drive far above the speed limit will have paying their fines; I focus on the increased safety and reduced injuries to people living in the communities where automated devices are placed. I would welcome such a device in my neighborhood*, despite the higher probability of my getting a ticket due to more frequent interaction. Do you have any easy solutions besides $100K fines? If so, what are they? i’ve stated them over, and over, and over, and over again in this thread. * directing any resulting revenue and/or even additional funding to transportation safety and transportation alternatives in communities where automated enforcement disproportionately impacts people of color and other marginalized communities. * development of an improved waiver/diversion process that helps mitigate geographic disparities in the punitive nature of fines (probably income-based). * progressive traffic fines (the vast of which would not be $100K fines, as you suggested above). a $160 fine for someone earning $200,000 does not have the same impact as a $160 fine for someone earning $10,000 does not have the same. i want to see us discourage well-off people from endangering vulnerable human beings to a similar extent as less-well-off people. in fact, all of these things are addressed in portland’s vision zero proposal and some have been put in practice in other communities. Why not invest general fund money in those communities? Let’s invest where investment is needed — no need to tie it to traffic violations. Increased diversion? I’m all for any alternatives that reduce reoffending. Philosophically, I strongly lean towards rehabilitation and away from punishment; if alternatives to fines are more effective at fixing the problem, or are equally effective with less collateral damage, I’m on board. I believe progressive fines would not pass legal muster in this country. If they do, I would consider supporting them. I have yet to see any evidence that there is widespread disregard of traffic laws by wealthier people because the fines they pay are too low, but I can’t rule it out either. Why not let the neighborhood associations decide how much more or less traffic enforcement that they would like. Should we be preventing neighborhoods from willfully profiling themselves? How do we know what these neighborhoods would choose if given the option. Seems like the city is taking a pretty arrogant position that it knows best what residence really want. Police have been carrying laptops in their crusers for a long time. Any competent IT guy should be able to feed them realtime data on the demographics of citations. They should be able to hit exact demographic distributions and report these back to the neighborhoods for input and adjustent of targets. I guess you could write code for a camera filter to only process images for darker-skinned folks. Tom, I agree a neighborhood should have some input on level of enforcement. I’m confused about your parts of your statement tho… what do you mean by “hitting exact demographic distributions” and “adjustment of targets”. Sounds like you haven’t had much experience with neighborhood associations. I don’t have any expectation of privacy when I’m driving, riding my bike, or walking on PUBLIC streets. I would love to see even more traffic cameras that not only enforce red light and speeding at any or all intersections but also did a spot check of cell phone use. If the images can identify the driver it can identify if they have a cell phone in their hand. Cell phone use in cars seems to diminish a bit right after a new law is passed and published but as time passes people increase their phone use while driving. As a bike rider I continue to see plenty of people using cell phones while driving. If drivers got expensive cell phone tickets due to random cameras place in the city it would not take long for drivers to modify their behavior. Such systems aleady exist. For example the one below. For the societal cost of one traffic fatality, the city could purchase more than 250 of these systems. At least the city could test one of them. That sign alerts people that data use is in progress? So it’s going to alert me that the streaming radio service I use in my car is on. Why not have a bunch of signs scattered around the city that say “speed checked by radar” and then have a mobile enforcement photo van that just changes locations thoughout the day. That way drivers are on their toes since the van could be anywhere. See Carfree’s comment above. The laws governing radar vans limit, handcuff? speed enforcement with that technology. There’s a problem with the legislature. Ask that question of your state Senator and Representative. My idea is that they have a few hundred fixed photo enforcement installations throughout the city, and a few thousand fake ones that look exactly the same from the outside, but cost significantly less per unit to install. People behave when you have 100% enforcement, or at least, the perception of it. We already have that. Some of the camera enclosures you see on corners are empty boxes. The city rotates the few cameras that the legislature allows them to have, between different locations, so people never know which one is “live”. I’ve never heard a justifiable reason why a city can’t have an unlimited number of speed and/or red light enforcement cameras. I suspect that legislators don’t want to get caught themselves. They really need to change the Hiring Practices of Law Enforcement. Take a look at all the hoops you have to jump thru to become a Portland Officer..it’s nuts! This problem has already been solved, and requires no traffic enforcement officers, no fixed automated enforcement, and no citations. Fleet operators solved this issue decades ago by using fleet telematics based on accelerometer and gyrometer data. This system is also now used by some insurance companies to incentivize calmer driving. This sensor data is continually analyzed by a software program which created metrics that indicate how aggressively someone drives. Instead of looking at individual violations, it looks at composite aggressiveness measured over time. A longer term composite picture of how hard someone corners, accelerates, breaks, and weaves, is an accurate predictor of collision risk. In this model, the city would be the fleet operator for all the drivers in the city. The worst of the worst aggressive drives, compared to peers, would be notified of their score and its breakdown, and given the chance to improve their score. Those with repeated bad scores and repeated warnings would have their licenses suspended. Thus you continually improve overall driving calmness over time. Way back when Michael Andersen covered a VZ event. Only difference was that Larry O’Dea (remember him?) represented law enforcement. It would be interesting to know how much all these nice people get paid to attend meetings versus how much money gets spent improving the streets and roads. nice to read about something besides rich people’s first world problems, “how dare those working class people drive through my neighborhood past my million dollar house on the hill”. I don’t care how much money you make. If you endanger the lives of my children by speeding through my neighborhood, I want you punished. Indeed, my neighborhood is a popular cut-through for a bunch of people who can’t be bothered to drive the speed limit. I’m for barriers, increased enforcement, lowered speed limits, pretty much anything to get them to drive respectfully or go somewhere else. I have no idea what the demographics are of the people speeding past my house, and I don’t care. How fines are used is an unrelated issue — enforcement is not (or should not be) an exercise in revenue generation. and i pointed out that we already charge fees or taxes on negative externalities and that these are often revenue generating. if you support a tax/fee/fine* on cigarettes (due to the negative externality of smoking/second hand smoke) then why is a tax/fee/fine on dangerous driving any different. Policing should not be seen as a revenue generating opportunity. Anyone who is concerned with the potential for abuse by the police should see that. That in no way contradicts my long held desire to see externalities factored into the way we do almost everything (including construction). Not viewing the police as a revenue collection service does not preclude issuing fines — it just means they shouldn’t be seen as a pot of money used to fund particular programs or initiatives. It may be OK to funnel that money into the general fund; it is probably not OK to direct that money to providing police pensions. There are thousands of gradations in between, and I am not able to say where to draw the line. I wish there was an UnRecommended button. Has anyone else noticed that there are two “Leahs” prominent in the whole Vision Zero thing? Ought to be able to fit one “Rachael” in there somehow. 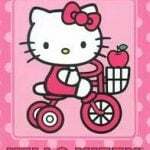 My motorcycle self identifies as a bicycle allowing me to ride in bike lanes and paths. If you disagree your racist!